We made this process how we want to buy -- easy and to the point! Here's how it works. Click on the vehicle of interest. 3. If you select Make Offer, enter your name, email, and if you require financing. 4. Type in your offer amount. You'll want to select the state where you will register the vehicle. As you enter your offer, our system will calculate your "out the door" totals for both shipping and driving in real time! Shipping is only a rough, ballpark estimate (for a car) and not a quote. For a quote, please contact our preferred shipping company Beacon Shipping or you can use your own. If you ship out of Arizona, you do not owe taxes to us, but you may owe taxes to your state upon registration. Please consult with your local DMV for any fees they may assess. 5. 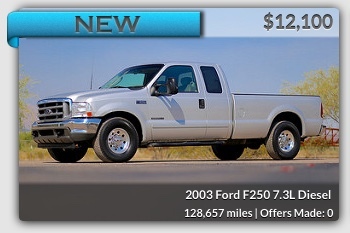 Proceed through a couple of explanatory screens and send the offer! If we counter, you will get the following screen. You will have the options to accept our counter, counter our counter, or decline our counter. You'll be taken to a form that will collect all of your info. Please complete that form and then view step 7. The end of the road. 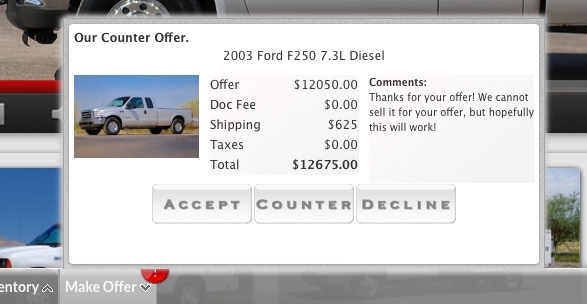 We do our best to price our vehicles aggressively. We can honestly say that every customer makes a good buy. We stay in business through making good buys on our end, not by selling vehicles for too much money. But sometimes we see more value in a vehicle than the customer -- and that's ok. Hopefully you'll give us a try on another vehicle soon! 7. Go to your online folder. The website will guide you here after completing the acceptance form. This page is your online deal portal. 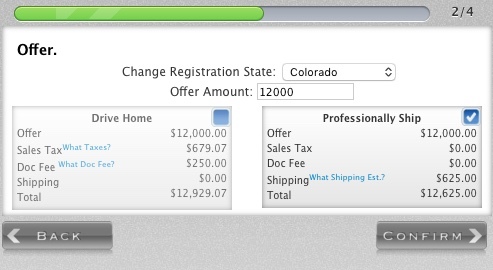 It will give you your totals, transaction status, docs to sign, and more info about the transaction. 8. Make a deposit. The vehicle remains for sale until a deposit is made. We pre-fill portions of the credit card form for your convenience, but all fields can be changed. Please remember that the vehicle remains for sale and the deposit is non-refundable unless you personally inspect and refuse the sale. If curious about why we have a non-refundable deposit, we explain it. 9. Take a look at the payment options. If you are financing, please print out the applicable docs in your "Current Status" and "Docs to Sign" tabs, including the purchase agreement and a copy of the title. If you are paying without financing, please click the "Payment Options" tab for information on wiring, mailing a cashier's check, direct deposit, and how to make out the check. 10. 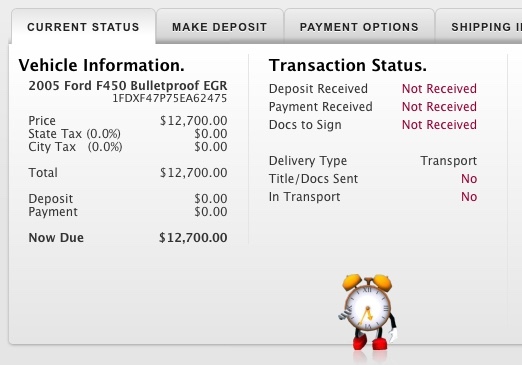 Watch the transaction status change. We keep the transaction status current up to the second. As the transaction moves, this will keep you up to date. 11. Take delivery. If taking delivery in person, safe travels and we will have your vehicle and paperwork ready. The entire process takes 5 minutes. It takes longer to get fast food than complete our process. If shipping, please contact your shipping broker for updates once it leaves. Unfortunately, your new vehicle's exterior will likely be dirty from shipping when it arrives. We hate that part. Here's your new, dirty vehicle. But there's just no way around it! 12. Enjoy! You just bought a vehicle without sitting in a dealer's "box" for 6 hours, wandering endless dealership asphalt with someone who can hardly spell his or her own name, and at a great price. We thank you for your trust and business and hope we can do it again soon!